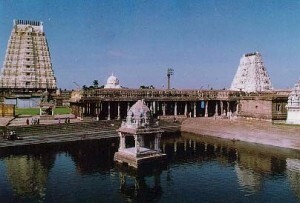 Kancheepuram, the city of thousand temples situated 70 km away from Chennai. Kancheepuram is one of the seven-scared cities of India. It is famous for its exquisitely woven silk sarees. Places to see include Ekambareswarar Temple, Varadarajaperumal Temple, Vaikundaperumal Temple, Kamakoti Mutt, Kailasanathar Temple, Kamakshi Amman Temple and the home of silk fabric weavers. Air: Chennai is the nearest airport at a distance of 70 km. Rail: Kancheepuram is the railhead. Road: Regular bus service is available. This entry was posted in Kancheepuram, Tamil Nadu. Bookmark the permalink.